z9 Capital Founders Form Special $21 Million Fund to Roll Out 80 Sliderz Locations Nationwide in Partnership with SLIDERZ MG, INC.
“This partnership will increase our national footprint much faster than we could have done on our own. We couldn’t be more excited to begin seeking out new locations according to our roll our plan,” says Buzzy Sklar, Sliderz MG.
Miami-based restaurant group, Sliderz MG, Inc. (“Sliderz MG”), is excited to announce a partnership with Boca Raton venture capitalists Benzion Aboud and Joe Randazza in securing $21 million in funding for Sliderz UL, LLC., ("Sliderz UL”) national expansion. Sliderz MG will have an exclusive management contract to operate the new locations. “This partnership will increase our national footprint much faster than we could have done on our own. We couldn’t be more excited to begin seeking out new locations according to our roll our plan,” says Buzzy Sklar, Sliderz MG, CEO and newly named CEO of Sliderz UL, LLC. Sliderz MG will work closely with Sliderz UL on implementing and executing an aggressive national rollout plan which will total 80 locations over the next five years. “My partner Joe Randazza and I are thrilled to be joining the Sliderz family at such a critical inflection point” says Benzion Aboud. 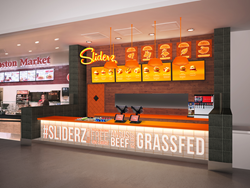 Each new location will occupy a non-conventional lease space with a main focus on mall food courts, airports, stadiums and casinos under a licensing and management agreement where all locations will be operated by Sliderz MG. Sliderz main goal is to bring a more healthy option to the fast-casual dining industry with naturally-sourced, high quality food that is hormone and antibiotic free. Sliderz is already expanding quickly in the South Florida area with a confirmed opening at Simon Malls operated Boca Town Center in August 2016 and active deals with General Growth Properties, Macerich and Westview taking possession of those locations in early 2017. This is an extremely profitable partnership for Sliderz as they will now be able to bring the innovative concept across the U.S. making it a nationally recognized brand. In a short time, Sliderz has gained recognition in the fast-casual industry being named by Fast Casual Nation as one of the top designed restaurants of 2015 and has been featured on NBC6, CBS4, WSVN, Today’s Grocer, Restaurant News, South Florida Business Journal, The Daily Meal, Boca Magazine, The Sun Sentinel, Urban Daddy, The Beach Channel, Thrillist, Eater and the Miami New Times.